Out of all the frantic political wreckage seizing the nation comes a small silver (or perhaps green) lining: Three more states have officially legalized the use of marijuana for medical or recreational use. As Michelle Obama once said, when they go low, we get high. Or something like that. 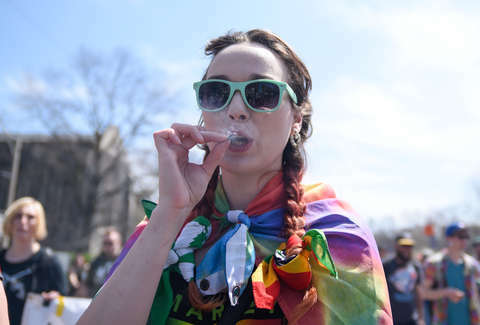 On Tuesday, voters in the state of Michigan elected to legalize recreational marijuana, making it the tenth state in the country to get behind the movement -- and the first in the Midwest. Proposal One, which is Michigan's new pot policy, allows adults age 21 and older to buy, grow, and possess up to two and a half ounces of marijuana for no reason at all. Recreation, people! And beyond that, adults are welcome to grow up to 12 marijuana plants in their homes, though they're obligated to hoard all that for personal use. Freelance drug dealing is still illegal. In Missouri, voters weighed in on three different legalization proposals surrounding the use and purchase of weed, but only one passed: Amendment 2 allows for medical and recreational marijuana use but with a 4% tax on sales, which will go directly towards health care services for veterans. That one definitely feels like a win-win. Utah, on the other hand, is slightly more complicated. Folks predicted that the state would vote to approve Proposition Two, which would allow patients to use and purchase maryjane for medical conditions like HIV, multiple sclerosis, post-traumatic stress disorder, and epilepsy. The proposition bans smoking, but vaping and edibles are still chill. Instead, state lawmakers went with a compromise bill, somewhere between Proposition Two and their own personal jurisdictions. This means that the powers that be in Utah have license to ban certain dispensaries in particular areas, each is required to have a pharmacist on staff, and edibles are prohibited along with smoking. It's not a lax policy, per se, but it's something (which, as they say, is better than nothing). In January, California, opened the country's first roster of high-end stoner hangouts (recreational pot shops), while Vermont became the ninth state in the nation to legalize pot for fun. In June, Oklahoma became the 30th state to legalize the stuff in some way. That's falling on the heels of legalization verdicts in New York, Georgia, Pennsylvania, Massachusetts, Texas, Chicago, and Florida -- all of which vary in their policies, but share a common belief that weed-consumption should, in some form, prevail. Apparently, we're not so far off from a country founded on life, liberty, and the pursuit of recreational marijuana. People like pot. This is a fact. Marijuana is the most commonly used illicit substance in the United States, and two out of every three Americans support legalization. If math is not your forté, that is well over half, and one by one, states are opting to support the shift. Hell, in 2018, you can already get paid to smoke weed for a living. In the realm of recreational marijuana, the limit does not exist.